1. 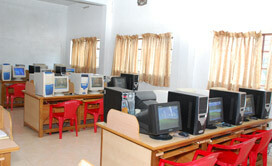 Our school is the examination centre for AISSE/AISSCE of CBSE since 2004. 2. Biggest children library consisting of 16000 books and 2000 reference books with 18 journals and periodicals and news dailies. 3. Laboratories for Physics, Chemistry, Biology and Computer Science. Seperate Computer Labs for Secondary and Senior Secondary sections. 4. Our School provides the Senior Secondary classes for the following courses - Science: Physics, Chemistry, Maths, Biology/Computer science and Commerce: Economics, Business Studies, Accountancy, Informatics practices/Maths. 6. 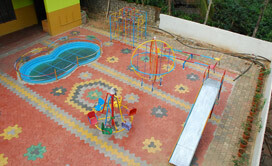 The school offers Seperate Hostel facility for Boys and Girls taken care of by wardens for the seperate sections. 11. Round the clock security. 12. School van to convey sick children to hospital and back. 13. Sky watch facility with telescope. 14. Smart class facilities for Bala Vidya Mandir and Vidya Mandir. 15. Services of 10 School Buses and private carriers for the conveyance of children. In order to promote democratic participation, students are given a facility called "IDEA BOX" wherein they can write their ideas and drop in the box in regard to the issues to improve campus environment. 1. 2 Acres of well laid play ground for Athletics, Basket Ball, Volley Ball and other outdoor games. 2. 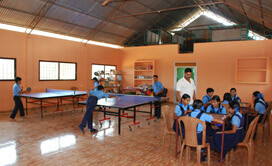 Auditorium for Indoor Games Like Table Tennis, Chess, Carrom Board, Etc. Our Principal is a mentor and has participated in several training programmes and workshops. Our Teachers have participated in Capacity Building programme conducted by CBSE Our teachers participated in the Orientation Programme for English conducted by Oxford University Press at our premise. Two of our teachers attended the workshop on Value based education organized by Bharatiya Vidya Bhavan, Kochi. Students counseling for Xth & XIIth, on the topic “To overcome fear of examinations” were handled by our Chairman DR.K.Jithendranath. A special counseling session was organized for the benefit of children of class Vth to Xth in the month of February by Mrs.Mithuna.